In the first of two rapid-fire weekend launches, a Falcon 9 rocket using a previously flown first stage boosted Bulgaria's first communications satellite into orbit Friday, clearing the way for another SpaceX flight Sunday, this one from California, to put 10 Iridium telephone relay stations into space. The first stage launched Friday first flew in January when it helped boost another set of Iridium comsats into an orbit around Earth's poles before flying back to a pinpoint touchdown on an off-shore droneship. It pulled off the same feat Friday, landing on a different droneship stationed a few hundred miles east of Cape Canaveral, despite a high trajectory needed by the satellite payload and the most extreme re-entry heating and stress yet experienced by a returning booster. In fact, SpaceX founder Elon Musk tweeted before launch there was a "good chance (the) rocket booster doesn't make it back." It did, but the booster landed hard and appeared slightly tilted to one side, using up most of the shock absorbing material in its landing legs. "Rocket is extra toasty and hit the deck hard (used almost all of the emergency crush core), but otherwise good," Musk tweeted. The successful launch and recovery -- the second time the California rocket builder has launched and recovered a first stage -- is evidence of the growing maturity of the company's on-going effort to reduce launch costs by recovering, refurbishing and relaunching major rocket components. SpaceX's Falcon 9 record now stands at 36 successful launches, one in-flight failure, one on-pad failure and 12 successful first-stage recoveries in 17 attempts, including the last eight in a row. The successful launch and landing should clear the way for SpaceX to fire off another Falcon 9 on Sunday, this one using brand new stages, from Vandenberg Air Force Base, Calif., carrying a second set of 10 Iridium NEXT satellite telephone stations. It will be the second of seven such flights to put 70 of the compact satellites into orbit as Iridium upgrades its constellation of telephone-and-data relay stations. For Bulsatcom, the company that paid $235 million to Space Systems/Loral to build, insure and launch BulgariaSat 1, Friday's launching marked a major milestone. The Ku-band satellite will provide television programming across the Balkans. "The project is of a big size for small country, and a relatively small company by world standards," Maxim Zayakov, CEO of BulgariaSat and Bulsatcom, told Spaceflight Now. "We now have about 900,000 subscribers between Bulgaria and the adjacent country of Serbia, and that is something, but in the grand scheme of things, compared with large companies, we're not that big." As such, he said, "the satellite is a huge thing. It's a big milestone and gives us a chance for ... more presence in the region, as well as throughout Europe, where we have our main coverage. And for the country, definitely, it's the first geostationary communications satellite." He said SpaceX's ability to recover and relaunch boosters will lower costs across the industry and that "really is a big deal." "People don't realize that, for small countries and small companies like us, without SpaceX, there was no way we would ever be able to even think about space," he said. "With them, it was possible. We got a project. I think, in the future, it's going to be even more affordable because of reusability." The mission got underway at 3:10 p.m. EDT (GMT-4) when the Falcon 9's nine Merlin 1D engines ignited and throttled up to full power, pushing the 1.2-million-pound rocket away from pad 39A atop 1.7 million pounds of thrust. After initially climbing straight up, the booster arced gracefully away to the east and disappeared from view over the Atlantic Ocean. Two minutes and 40 seconds later, after pushing the 229-foot-tall vehicle out of the thick lower atmosphere, the first stage engines shut down and the stage fell away to begin its descent to the droneship "Of Course I Still Love You." The single engine powering the Falcon 9's second stage continued pushing BulgariaSat 1 to space. The first stage, meanwhile, 1fired three of its engines to slow down, oriented itself tail first and fell back into the atmosphere, deploying four stabilizing "grid fins" at the top of the booster to help maintain the proper orientation. Three engines then re-ignited as the rocket approached the droneship, four landing legs deployed and the stage settled to a landing on the "Of Course I Still Love You" eight-and-a-half minutes after launch. The second stage engine fired for nearly six minutes in the first of two burns required to put BulgariaSat 1 into the proper elliptical orbit. A second one-minute five-second firing completed the job and 35 minutes after takeoff, the 8,100-pound spacecraft was released to fly on its own in an orbit with a high point of around 37,000 miles. On-board thrusters will be used to put the satellite into a circular orbit 22,300 miles above the equator where it will appear to hang stationary in the sky above the Balkans. After tests and checkout, Zayakov said, the satellite should be ready to enter service in early August. With BulgariaSat 1 safely on its way, SpaceX will turn its attention to Sunday's launch from Vandenberg. Liftoff from pad 4-East is targeted for 4:25 p.m. EDT. Because of the weight of the 10-satellite payload, an on-time launching is required or the flight will be delayed at least 24 hours. As with Friday's flight, SpaceX plans to land the Iridium first stage on another whimsically named droneship, the "Just Read The Instructions," stationed due south of Vandenberg. SpaceX plans to launch another Falcon 9 from the Kennedy Space Center in July to put an Intelsat communications satellite into orbit. 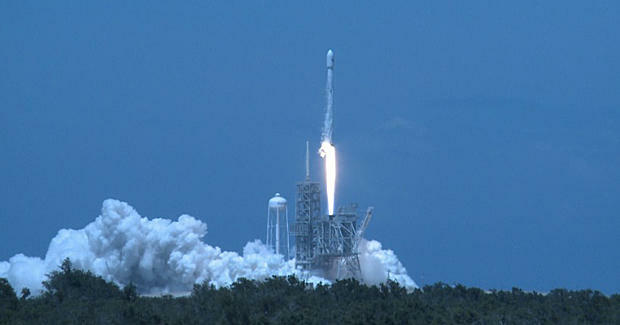 The rapid-fire launch schedule over the past two months reflects SpaceX's drive to work off a backlog of satellites delayed by earlier problems, including a Sept. 1 launch pad explosion that destroyed a Falcon 9 and its satellite payload at the Cape Canaveral Air Force Station.